This bride and groom photo of Jessie & Steve, was photographed in the bank vault at the spectacular Metropolitan at the 9. Jessie and Steve held their beautiful wedding reception at the Metropolitan at the 9 in downtown Cleveland, Ohio. Their amazing wedding ceremony and many of their photos were conducted at the spectacular Botanical Gardens in Cleveland, Ohio. The Metropolitan 9 is located in an old bank vault and there are so many amazing photo opportunities. There are many eclectic rooms to the space with many photography options. Add a little moody lighting and like magic, a beautiful bride and groom portrait is created. 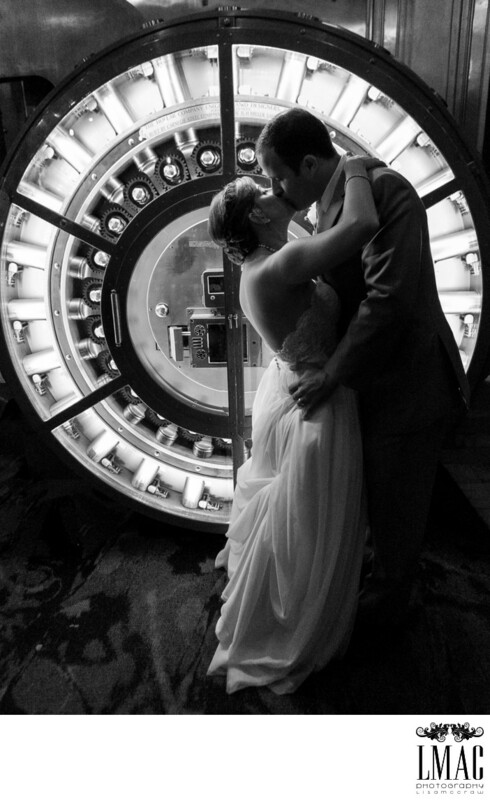 The best wedding photos sometimes include unexpected elements such as this bank vault.